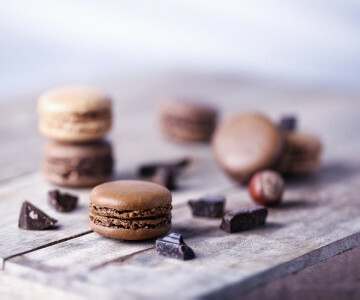 As pretty as they are impressive, these chocolate and vanilla macarons make perfect petit fours or a sophisticated addition to your afternoon tea. They are easier than you think! You will need 2 baking trays lined with non-stick silicone coated baking parchment. Draw rounds 35mm in diameter on the paper 4cm apart. 1) Pulse together the icing sugar and ground almonds in a food processor fitted with a blade then tip into a bowl. 2) Add half of the egg whites and the vanilla then mix to a smooth thick paste. 3) Tip the remaining eggs into a clean mixer bowl with the cream of tartare and whisk to soft peaks. 4) Bring the sugar and water to the boil in a saucepan until it reaches 118c. 5) Slowly dribble the hot syrup into the whisked egg whites whilst beating on full speed. 6) Keep whisking the meringue until just warm. 7) Fold the meringue into the almond sugar paste until a thick smooth consistency. The batter should fall in a thick ribbon from the spatula. 8) Place the batter in a piping bag fitted with a 1cm plain round nozzle. 9) Pipe rounds onto the prepared baking trays using the circles as a guide. 10) Once you have filled a tray knock it on the worktop to expel any air and flatten the macarons slightly. 11) Repeat until you have used up all the batter. 12) Place the trays on one side for 2 hours so the macarons form a skin. This is the key to great macarons and success. 14) Bake each tray individually in the middle of the oven for around 20 minutes. The macarons are ready when you gently press on them and they no longer move. 15) When ready remove from the oven and transfer them onto cooling racks still on the paper. 16) Once cool they should simply peel off the baking parchment. 17) Make the filling next. Place all the ingredients into a bowl except the cream. 18) Bring the cream to the boil and pour over the ingredients in the bowl. 19) Leave for 1 minute before stirring to a smooth ganache. 20) Leave on one side to cool and begin to firm. Stir every 10 minutes or so to help it cool and come together. 21) Pipe the filling onto macaron halves using a piping bag fitted with a 1cm plain round nozzle once it has cooled enough to just hold its shape. 22) Place another macaron half on the top and gently press together. 23) Keep the finished macarons in an airtight box in the fridge until needed. They will keep for around 3 days and are always better the day after making them.